We can't wait to play with pigments with you! Before we can book your event, please make sure you read and understand the information below. This page should answer your questions about hosting a paint party, but if you find that you still have questions please don’t hesitate to contact us. Reach us here: contact info. We are currently accepting private events in the Leavenworth, Kansas area! 1. 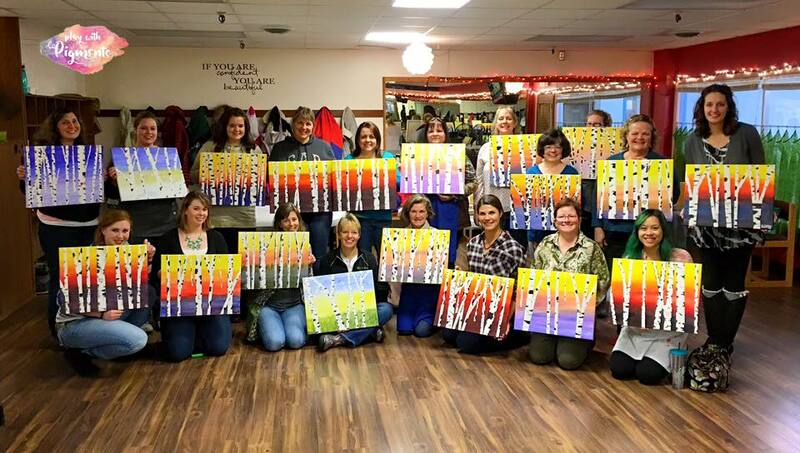 We will provide an Entertainer/Artist to host a Paint Party that will last 2-3 hours depending on the design. 2. We will provide all art resources required for the event. 3. We will setup/breakdown all art materials needed for our events. 4. We will provide an online system for ticket purchase. There is a required minimum of 10 guests or payment for 10 guests if 10 do not attend. Therefore, you are responsible for ensuring that a minimum number guests are paid for at the start of the party. The cost is $35-$45 per painter. Once we verify that your requested date is available, we will create an event page on our website where your guests purchase tickets in advance. We charge a Setup Fee of at the cost of one ticket to setup your event. Your event will not be officially in the books until have paid the setup. Once we confirm the event date and details, I will send an invoice for the Set Up fee to the email address provided. When your event is booked, the setup fee becomes the payment for the host’s seat at the paint party. In effect, we are not charging anything extra for the booking; we are just requiring a minimal processing fee to be paid in advance to setup the event details. Like public tickets to classes, refund and exchanges for Setup Fees due to cancellation and rescheduling is not available, as the work will already have been completed. There is a travel fee starting at $15 for locations outside of our studio. The exact price will be determined based on the specific location. We encourage you to have your private party at our studio as we will have everything you’ll need in one convenient place. In this case, the minimum painters required is reduced to 5 painters or paid for 5 painters. You may choose to have your event in a space that you arrange, in which case standard requirements apply. Please note there is a travel fee depending on your location. When hosting at our studio, we will have all art materials set up for you in advance. You may bring food and beverages along with serving items (plates, cups, utensils, etc.) to our studio, however you will be responsible for clean up of those items. When hosting at your own location, you will be responsible for setting up tables and chairs for the event. Please ensure that there is sufficient seating and elbow room for each painter and their supplies. We recommend you cover up painting surfaces as there may be some paint spatter while painting. Also, don’t forget to set up a space for me to teach. It’s important that everyone can see me instruct step-by-step. The Event Organizer (you) assumes full responsibility for any damages to the location, equipment, patrons, or our personnel due to negligence, including such caused by any vendor contracted by the Event Organizer to be on the premises (caterer, DJ, etc.). Despite the best intentions and most organized of plans, we understand that unforeseen events can arise, so please let us know immediately! Should you need to cancel or reschedule your event, your Setup Fee will be forfeit if we are not notified at least 7 days in advance of the event’s start time. You may opt to reschedule your Private Party at no charge if you have met the notification deadline of 7 days notice. There are no exceptions and no refunds for Setup Fees. Furthermore, tickets purchased by your guest are non-refundable and cannot be exchanged for a different event unless it is for your rescheduled event. Outside food and drinks are allowed when hosting at our studio. For events hosted at off-site locations owned/maintained/acquired by the Event Organizer, the Event Organizer is responsible for obtaining permission from the location. The Event Organizer assumes all liability for the service of alcohol. No open containers will leave the premises. No underage drinking is allowed. Looks like you did your homework and are ready to party! For the most comfortable experience, we recommend filling out the form on a computer or larger tablet rather than your smart phone. Ready to submit your request? Click here!